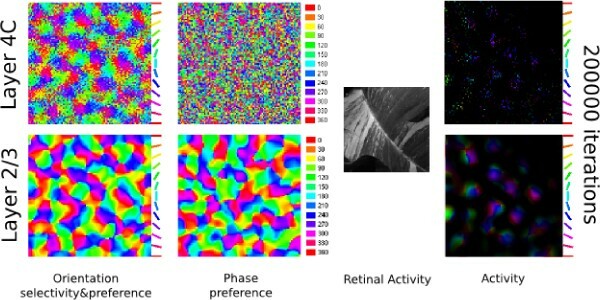 Hubel and Wiesel classified primary visual cortex (V1) neurons as either simple, with responses strongly modulated by the spatial phase of a sine grating, or complex, largely phase invariant . Much progress has been made in understanding how simple cells develop, with detailed computational models establishing how they can form topographic maps ordered by orientation preference. There are also models of how individual complex cells can develop using outputs from simple cells with different phase preferences, but no model of how a realistic topographic orientation map of complex cells could be formed based on the actual connectivity patterns found in V1. Addressing this question is important, because a majority of existing simple-cell models produce maps that group similar spatial phases together, which is contrary to experimental evidence, and makes it difficult to construct complex cells. Overcoming this limitation is not trivial, because the simple-cell models are driven by correlations in the input, and phase is more highly correlated than orientation in natural images. In this work, we model V1 as two topographically organized sheets, one representing cortical layer 4 and one representing layer 2/3. Only layer 4 receives direct thalamic input. Both sheets are connected with narrow feed-forward and feedback connectivity. Layer 2/3 contains stronger and longer lateral connectivity than layer 4C, in line with current anatomical findings. Initially all weights in the model are random, and each is modified via a Hebbian learning rule. The model develops smooth, matching, realistic orientation preference maps in both sheets (see Figure 1). Layer 4 units become simple cells, with phase preference arranged randomly, while those in layer 2/3 are primarily complex cells. To our knowledge, this model is the first explaining how simple cells can develop with random phase preference, and how smoothly organized maps of complex cells can develop, using only realistic patterns of connectivity. Orientation preference and phase preference maps after 20000 training iterations (left). An example of the response of neurons in both cortical layers to a natural image stimulus (right). This work has been carried out using the Topographica simulator, available freely from http://www.topographica.org. This project is funded by the Engineering and Physical Sciences Research Council and the Medical Research Council UK through Edinburgh University Neuroinformatics Doctoral Training Centre. Thanks to Chris Ball, Judith S. Law, and Chris Palmer for discussions and suggestions.